"She gets it. I told her this about getting your mojo back." 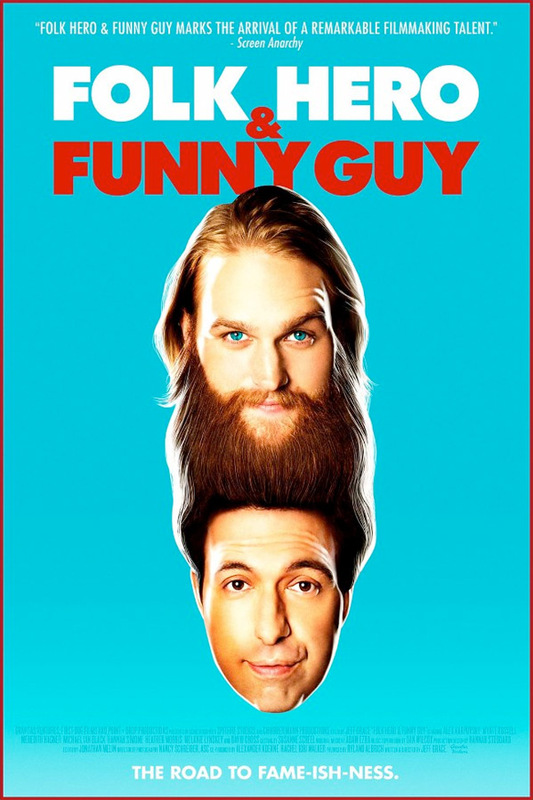 Gravitas Ventures has debuted the trailer for the indie comedy titled Folk Hero & Funny Guy, about "a folk hero and a funny guy", as played by Wyatt Russell and Alex Karpovsky (respectively). The story is about a struggling comedian named Paul, played by Karpovsky, who is talked into being the opening act of his folk-music friend Jason's solo acoustic tour of the east coast. Everything seems to be going well, until Jason reveals an ulterior motive behind the tour. The cast includes Meredith Hagner, Melanie Lynskey, Hannah Simone, Michael Ian Black, Heather Morris and David Cross. This looks funny and heartfelt, and it's always good to see Alex Karpovsky with a key role in a film. Though, as one of the quotes points out, this seems to be about the entire ensemble cast. Recently dumped by his fiancée and struggling with a stagnating standup routine, aspiring comedian-slash-copywriter Paul (Alex Karpovsky) is stuck. The manager of the club where he performs suggests he take some time off to update his material, and in waltzes his childhood friend Jason Black (Wyatt Russell), an acclaimed folk-rock musician about to embark on a solo acoustic tour of the east coast. Jason suggests Paul needs to get his mojo back—and he should start by opening for Jason on tour. They set off on the road together, picking up a new act (folk singer Bryn, played by Meredith Hagner) on the way. Folk Hero & Funny Guy is directed by actor/producer/writer Jeff Grace, making his feature directorial debut with this film. This premiered at the Tribeca Film Festival last year, and played at the Seattle Film Festival. Gravitas Ventures will release Folk Hero & Funny Guy in select theaters + on VOD starting May 12th this summer.